The Green Flower Certiﬁcation Program elevates and validates your knowledge of cannabis, raising the level of trust, credibility and skill in the cannabis industry. Increase your knowledge and conﬁdence by enrolling online, passing the test and receiving your Green Flower Certiﬁcation. THE FASHION INDUSTRY THROUGH CBD COSMETICS SOLACE Joint & Muscle Pain Relief Cream Solace uses only high-quality, organic, full-spectrum, hemp-derived CBD oil to increase the effectiveness of it’s pain killing abilities, without any psychotropic effects. This patented technology improves permeation by up to 70%, and is one of only a handful of products on the market that are backed by research from top scientists and clinical trials. This means that you’ll receive a faster and more effective result than other products. Watch for our entire lineup of CBD cosmetics this Spring. More than just a State of Mind! processing, and manufacturing laboratories with industrial kitchens for production of infused and edible products. When it comes to cannabidiol, confusion reigns supreme. We’re going back to basics to clear it up for you. 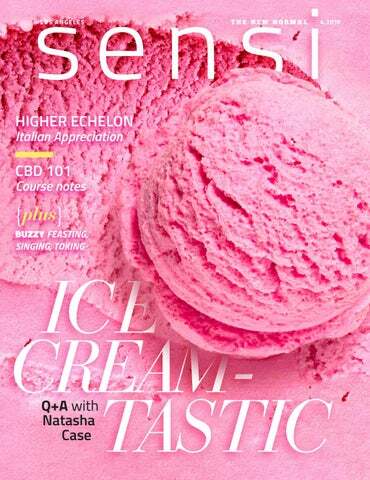 Sensi magazine is published monthly by Sensi Media Group LLC. MICHELIN RATED Gorgeous. Rustic. Italian. © 2019 SENSI MEDIA GROUP LLC. ALL RIGHTS RESERVED. Cannabis Affairs April 13 // 10 a.m. – 4 p.m. Photography is a fascinating artform. The Getty Museum is featuring the works of seven contemporary artists—Eileen Cowin, Christina Fernandez, Samuel Fosso, Yasumasa Morimura, Yinka Shonibare MBE, Gillian Wearing, and Qiu Zhiji—who were tasked with reimagining past events. Given an opportunity to tell the untold and underrepresented stories to establish their own narratives, the results are presented in a colorful and sometimes unusual collection now on view. Restaging past events in three topics—personal history, political history, and art history—allows for a new narrative on moments of history that may have otherwise gone overlooked. This exhibition is a way for the past to be retold through modern eyes. Since its ﬁrst show in 2007 featuring country legend Willie Nelson and classic Lucinda Williams, Stagecoach has become the best mainstreamwith-a-touch-of-indie-country music fest around. Hell, it even had the Exes from the TV Show Nashville perform a few years back. This year, country music lovers get to come together in their daisy dukes, cowboy boots, rhinestone jackets, and Boho-chic, Instgram-ready attire to listen to the likes of Luke Bryan, Lynyrd Skynyrd, Sam Hunt, Ashley Monroe, and more (though this year there aren’t as many ladies performing). With special features like Guy Fieri’s smokehouse, pit passes, an energy playground, pop-up shops, a honky tonk dance hall, and even a recycling center, guests will be up to their ears in music and good ole-fashioned Americana country. Ella Mai April 17 // 8 p.m.
Download the Greenlight App to Order Ahead and Earn Rewards! Text Greenlight to 31996 to Get Started! component in the dishes he creates. and to the table, I asked chef a few questions about his life in Lucca, the menu, and more. Build your customer base and reach more women through Ellementa. and cocktail bar sends your experience over the top. wine for me is special because it reminds me of harvest. NATASHA IN THE HAUS How calling a custom ice cream pint a cool house led to the birth of Coolhaus. lowed you to bring about social change? take her cookies and ice cream, which she decided to call Coolhaus, on the road—to Coachella. That is where this ice cream and cookie empire began. me to be a mentor and evoke change in my community. you decided to buy the postal van and head to Coachella? In that same vein, what was the most hindering? like when imagining a structure, room, or design? fuel to go on, knowing that even if I failed I had a team rooting for me. Growing up, what was your favorite ice cream flavor? And your wife’s? My favorite ice cream then and now is cookie dough, and Freya loves rocky road, which we don’t make, but our Campfire S’mores is very similar. 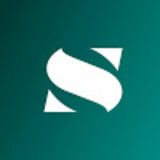 What is in the pipeline for brand development? Any new flavors, products, or sammies coming out? April is a very exciting month, as Coolhaus is releasing six new dairy-free flavors, including pints and sammies, as well as seven new dairy flavors online and in retail. drive a lot of attention to the uniqueness of the brand. foods could catapult into such success? industry that has been bastardized. nothing like it on the shelf. Coolhaus offers a budding array of sweet, heavenly goodness online at COOL.HAUS.COM . you’ve learned and implemented along the way? with, ingredients wise? Any you loved but had to ditch? You can walk through a wall if you don’t know it’s there. although some people did love it. the value of utilizing knowledge and imagination, what would you say? die-hard ice cream sandwich lovers who can’t eat gluten? Something big is launching in 2020, although I can’t say what! Gluten-free customers can enjoy our dipper bars, and a ton of our pints are gluten-free. Tell us about the Midnight Munchies flavor. The Midnight Munchies flavor is chocolate peanut butter ice cream with chocolate-covered pretzels and peanut butter cups. Want To Attend Rock Star Chefz Cannabis Celebrity Chef Milz 4/20 Exclusive Interactive Dining Experience Extravaganza For FREE? THE KUSANAGI AND CAKE Celebrating all things fantastical with our taste buds this month. • 1 droplet Hellfire bitters • ¼ oz orgeat syrup • ½ oz hibiscus syrup (1886 makes in-house, but you can buy it as well) • ¾ oz fresh-squeezed lemon juice • 2 oz Haku vodka INSTRUCTIONS STEP 1: Combine all ingredients in cocktail shaker. STEP 2: Combine blueberries with lemon zest and basil. one at a time, beating well between each addition. Add milk and combine. with the mixer running, until incorporated. top is golden brown and an inserted bamboo skewer comes out clean. I WAS INSIDE A HEATED YURT, EATING COOKIES, TOTALLY LOST IN MY OWN HEADSPACE, WHEN I HEARD WHAT SOUNDED LIKE AN ORCHESTRATED COLLECTIVE GASP. The lights on this particular evening were extraordinary. The entire sky was shimmering with waves of lights flashing from one side to the other. I would be completely hypnotized by one light display only to realize that if I looked the other way, another, just as brilliant display was also taking place. I had a few moments of panic because I didn’t know where to look. My senses were happily overwhelmed. At moments, I could feel the actual energy from the lights going through me. It was all very dreamlike, and I questioned myself a few times because of, well, the weed, but thankfully, the photos I would later see of that moment matched up to my memories—and just like that, this Aurora sighting would top the list of the most incredible experiences of my lifetime. The following Yukon venues offer opportunities to experience the Aurora Borealis for yourself. Please note that cannabis is not required but is highly encouraged—if it’s your thing. MY SENSES WERE SO HAPPILY OVERWHELMED. learn about living on the land during the winter months. THINGS YOU MAY HAVE NEVER KNOWN ABOUT THE NORTHERN LIGHTS, AKA AURORA BOREALIS. 1. Aurora is the Roman goddess of dawn, and Boreas is the Greek term for the north wind. 2. Gas particles from the earth colliding with charged particles from the sun’s atmosphere cause the Northern Lights to appear. These protons and electrons travel millions of miles. 3. Dating as far back to the 1600s, people have been in awe of the Northern Lights’ wonder, and some Inuit believe the lights act as the spirits of their ancestors playing a game. 4. While many colors are visible, if you witness pure blue light, consider yourself lucky as that is very rare. 5. Aristotle is among the first to give a scientific account of the lights back in 4th century BC. He concluded they were flames of burning gas. A 13thcentury study called “The King’s Mirror” suggests the lights are reflections from Earth’s oceans. A new life is always on the horizon. Red Rock Fertility Center is Nevadaâ&#x20AC;&#x2122;s 1st & only boutique-styled center. We specialize in personalized physician care & expertise in an intimate and cozy setting. Yes, it’s confusing. Here’s a handy cheat sheet: Cannabis sativa: plant species. help. 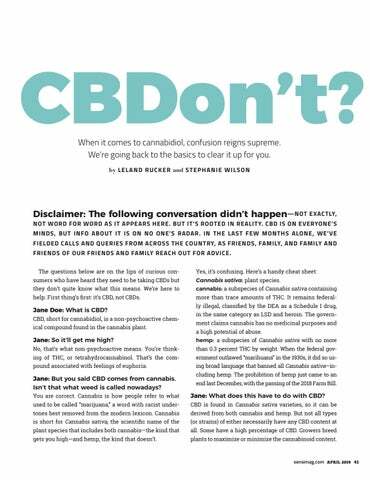 First thing’s ﬁrst: it’s CBD, not CBDs. Jane Doe: What is CBD? CBD, short for cannabidiol, is a non-psychoactive chemical compound found in the cannabis plant. Jane: So it’ll get me high? pound associated with feelings of euphoria. Jane: But you said CBD comes from cannabis. Isn’t that what weed is called nowadays? cluding hemp. The prohibition of hemp just came to an end last December, with the passing of the 2018 Farm Bill. Jane: What does this have to do with CBD? gets you high—and hemp, the kind that doesn’t. plants to maximize or minimize the cannabinoid content. Jane: So what are the effects of CBD? take it across state lines—but don’t let that stop you. a low potential of abuse, similar to low doses of codeine. Jane: Are you saying the effects of eating a CBD cookie or two are the same as taking a dose of prescription cough syrup? That’s intense. with the very basics that can be built upon. There’s not even an ofﬁcial cannabis seed bank or strain database in existence from which scientists can pull reliable information needed to conduct the studies from which we are so desperate to learn the results. The process is basically just getting started, and it’s going to take awhile. Decades even. That said, there is strong anecdotal evidence as well as some small studies that point to medicinal properties and health beneﬁts. Secretions from the ﬂower of the cannabis plant contain more than 100 chemical compounds known as cannabinoids—CBD and THC among them—that interact and bind to receptors within our body’s endocannabinoid system, which regulates basic functions like sleep, cognition, and stress. Cannabinoids such as CBC, CBG, CBN, THCa, THCv, and so on are said to provide relief to an array of symptoms and ailments—migraines, insomnia, stress, Crohn’s, PTSD, Parkinson’s, epilepsy, cramps, cancer, and more. Like magic. Until science tells us otherwise. CBD is a miracle compound, said to ﬁx whatever ails you. Or not. Depends on which you trust— science or marketing. Jane: Me too! I think I read the same article. So, what’s the best kind of CBD? Oh my. There’s only one kind of CBD. But there are all sorts of factors that affect its quality and your experience. Some factors to keep in mind: 1) Is it derived from hemp or cannabis? 2) If it’s derived from hemp, where is the hemp from? The US imports a lot of hemp from China, where the list of approved pesticides is far from safe. You don’t want to be ingesting that. Jane: So what does taking CBD do? 3) Is it a CBD isolate? Was the CBD isolated from the other plant compounds during the extraction process? tourage effect, but we’ll save that for another day. all of the cannabinoids found in the plant. Jane: That’s it? All this hype for something that may reduce anxiety and inﬂammation? Yep. There’s a whole lot of anecdotal evidence about it being an effective treatment for other ailments, but there’s not a whole lot of science. Yet. Business Journal puts that number closer to $1 billion. your body, or pay a massage therapist to do that for you. CBD than the labels claimed. Some had none at all. 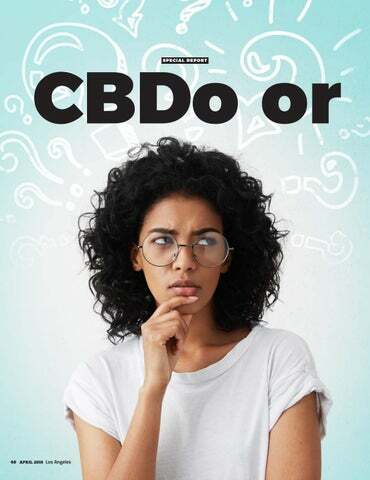 Jane: How much CBD should I be taking? chew gum made with it, you can give it to Fido as a treat. What you can’t do is ignore it. CBD dominates headlines, piques interest, generates anecdotal testimonies to its healing powers, and is marketed to you hard by a growing range of companies introducing new infused products and new brands in hopes of capitalizing on the buzz. They don’t all have your best interest at heart. Be skeptical. Jane: But…I should be taking it, right? I’ve heard I should be taking it. According to articles on the internet, you deﬁnitely should. ing. Personally, I’m a sucker for marketing. pop-up music festival. People of all ages gathered to dance, smoke, eat, and play together in the desert, complete with obstacles courses, inflatable rides, bean bags to chill out on, and moreâ&#x20AC;&#x201D;all in the name of kindness. KISS THE GROUND A little green for farmers. er and co-founder of Kiss the Ground. several other farmer training programs.